The rising popularity of a freestanding tub has changed thoughts on bathroom design. In the past the tub was surrounded by tile work to create a focal point (to take the attention away from the tub). A freestanding tub is meant to be the focal point, their beauty and presence commands it. Yet they provide all the comfort and functionality of a drop-in tub. We carry quality bathtubs with strong warranties. Our tubs come to you factory direct and we pass those savings on to you, giving you high quality at reasonable prices. You don't have to wait for specials, search for a coupon, or cross your fingers and hope for a good deal. Our freestanding bathtubs are always on sale. We will ship our tubs anywhere in the contiguous US free of charge. 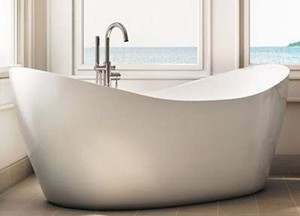 Tubz.com has a large selection of freestanding bathtubs. For easier shopping choose size or style below. Click on the tub picture to find out more about sale prices. 42" x 42" x 33"
43" x 43" x 37"
48" x 30" x 22"
51" x 26" x 23"
51" x 28" x 24"
52" x 36" x 34"
52" x 52" x 26"
52" x 52" x 27"
52" x 52" x 36"
53" x 53" x 25"
55" x 27" x 23"
55" x 28" x 24"
55" x 30" x 23"
55" x 30" x 27"
56" x 29" x 23"
56" x 32" x 22"
56" x 32" x 24"
57" x 31" x 22"
57" x 31" x 24"
57" x 35" x 27"
57" x 36" x 25"
58" x 26" x 22"
58" x 30" x 22"
58" x 30" x 24"
58" x 31" x 21"
58" x 32" x 22"
58" x 36" x 24"
Freestanding Soaking, Air, Whirlpool or Heated Bathtub? Heat panels are integrated into the structure of the bath to warm the bath much like the heated seats in a car. Heated surface systems will not maintain the temperature like a heated soaking tub but they add luxury. When shopping through our freestanding tubs by size, you will see the tub systems listed in the description. Look for "Heated Surface"
59" x 34" x 25"
69" x 30" x 25"
63" x 28" x 24"
67" x 32" x 21"
67" x 37" x 26"
69" x 34" x 24"